Hi @amsuhane, thanks for this pull request! I will need some more time to read the tests because they are a bit long, but in the meanwhile could you please fix the import order? The "quality" step is failing because of that reason. You can apply isort yourself using isort --recursive --project poliastro --section-default THIRDPARTY src setup.py (or, if you have poliastro installed in your development environment, which is the usual thing to do, just isort --recursive src). Merging #602 into master will increase coverage by 2.47%. Powered by Codecov. Last update 0433a1d...eef0ffe. Read the comment docs. Merging #602 into master will increase coverage by 2.41%. Powered by Codecov. Last update c8f316c...467e3ce. Read the comment docs. I left some comments, but the tests are so long that in general from a quick overview it's difficult to understand what are we testing. It is only the values of the constants? I'm not sure where does all that logic come from, but it's essential to document it and find out if we can simplify it. Can you please write a link at the top of the file to see where can we get these values from? I think this was not done yet? We should have this information in the code, not only in the tests. Just a line in the top docstring stating where do they come from, as it's done in other modules. Orientation models to calculate the rotational elements (ICRF right ascension and declination and prime meridian location) are given in the kernel file "pck00010.tpc", provided by Nasa. These models have been used to calculate the rotational elements. The kernel file provides the coefficients of polynomials and trigonometric terms of the models. Hence, in the tests, coefficients are taken from the kernel file and plugged into the polynomial/trigonometric terms. @Juanlu001 I am not sure how to correct the error FileNotFoundError: [Errno 2] No such file or directory: '/home/circleci/repo/src/poliastro/tests/kernels/pck00010.tpc'. The tests are running fine locally. The tests are running fine locally. Perhaps because you already created the directory? May I request that the only two SPICE experts that I know, @AndrewAnnex and @marcsit, take a look at this pull request when they have the time and will to do so? 😊 It would be great to confirm that we are following the right approach here. I just discovered https://github.com/esaSPICEservice/spiops by the way, in case it's any useful. I'll look into spiops. Thanks for the link! I added some extra comments. Also, this will need a git rebase on current master. 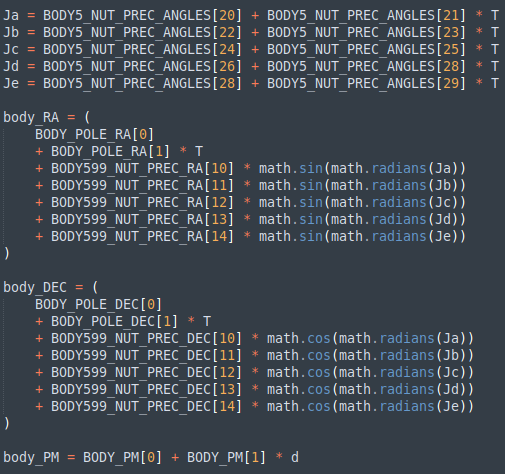 I was shocked when I saw the code the first time some days ago, but then I realized it's exactly the same logic we're applying in bodies.py. Perhaps it would be better to have functions that can be reused, so they just receive appropriate numerical values? That would make these tests shorter. I'll start working on the functions.